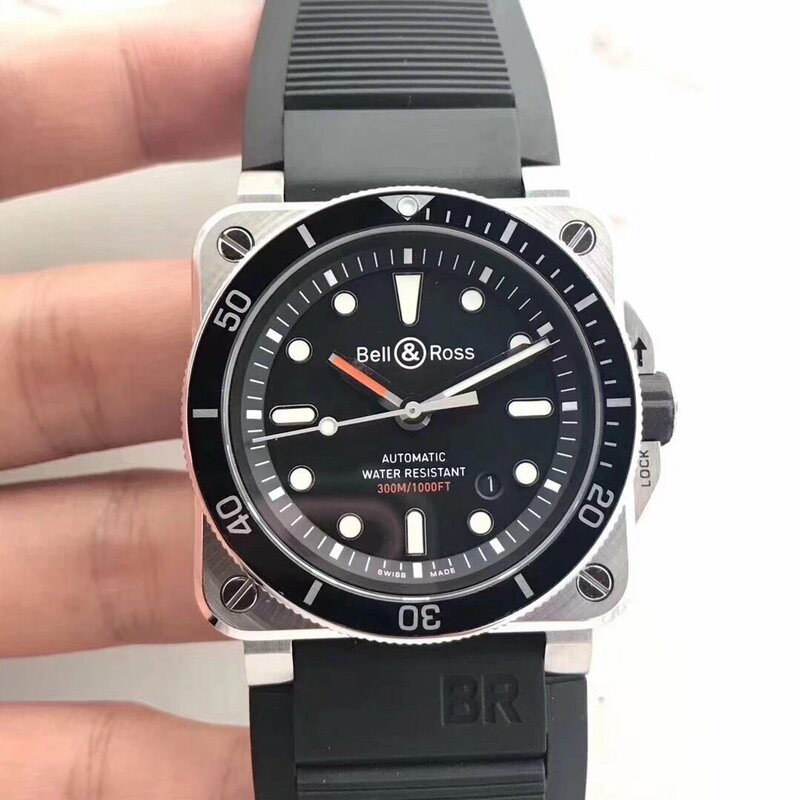 Now it is hard to find good quality replica watch if there is not trusted dealers, many readers here also complain about this and they leaved comments about when there will be a trusted dealer recommended, for secure reason, I do not introduce any watch dealers here because I really don’t know which dealer is the best and trust worthy. 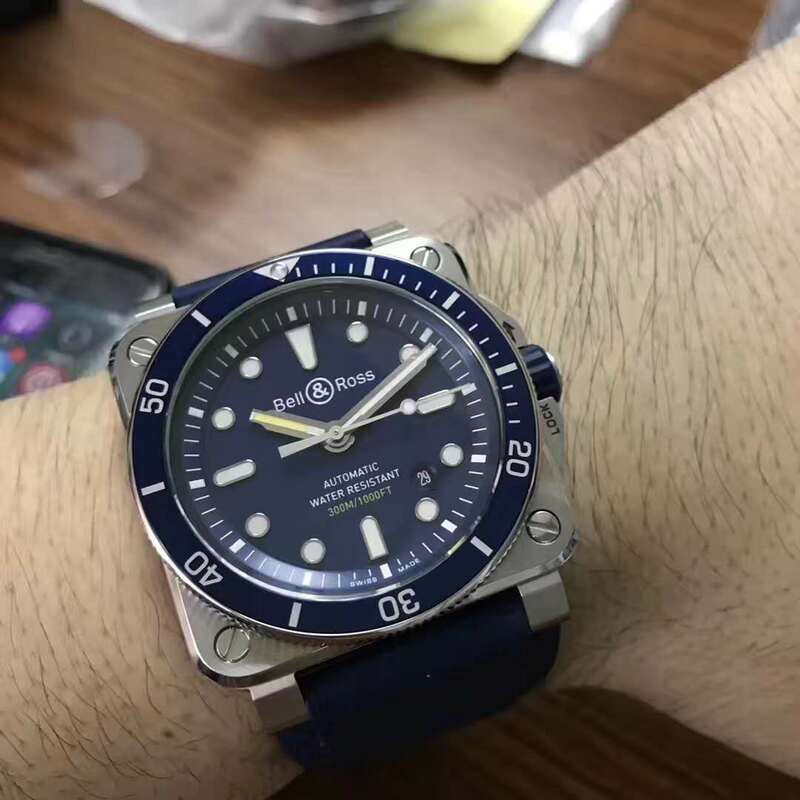 I am also afraid the one I will recommend to you guys would not offer the biggest satisfaction. 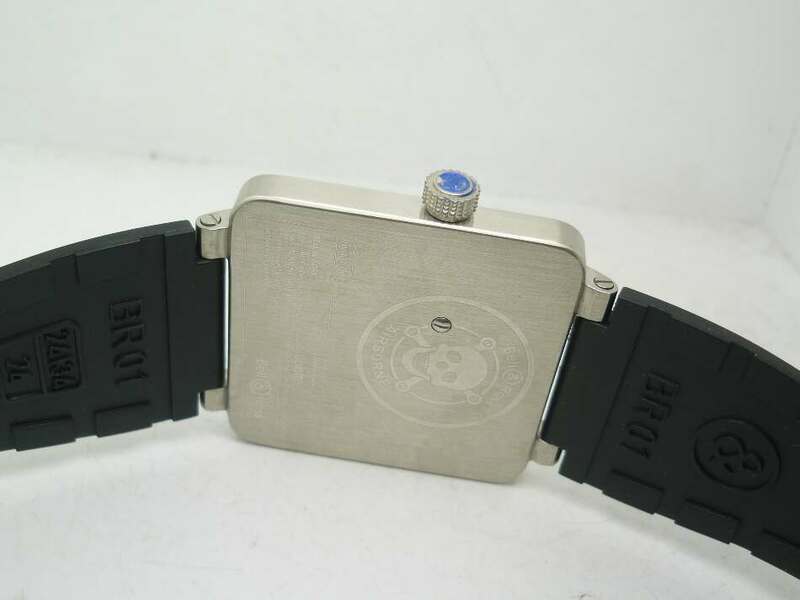 But I promise there will be one td in the future and I know he offers a large variety of high quality replica watches. 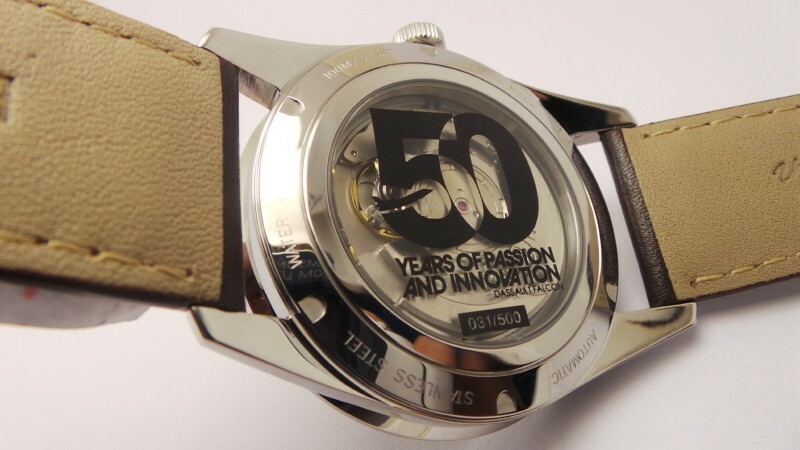 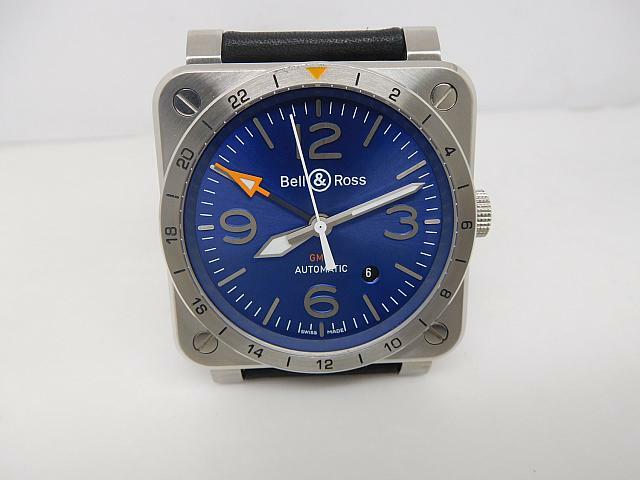 Here the watch I am going to introduce is the news I got from him, he just told me this morning that a factory will release this Bell Ross replica watch and I am the lucky person to get one first to take some photos and share a short review here, which I really introduced few Bell Ross watches on my blog. 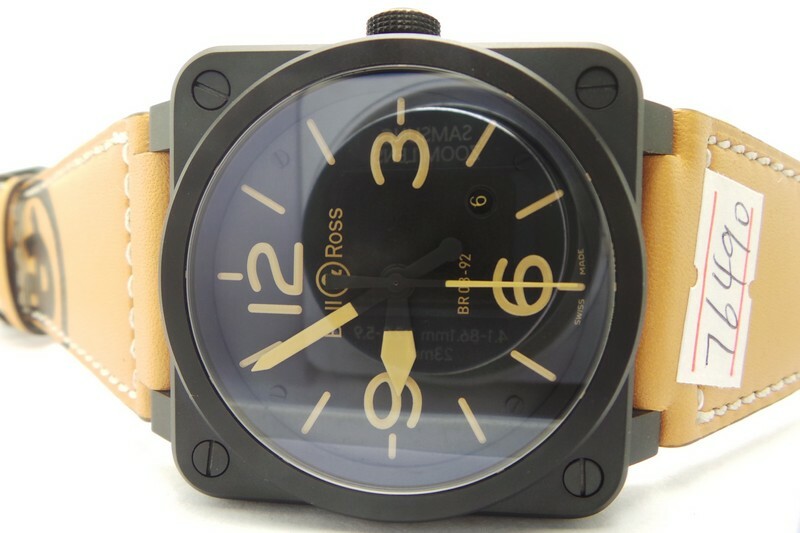 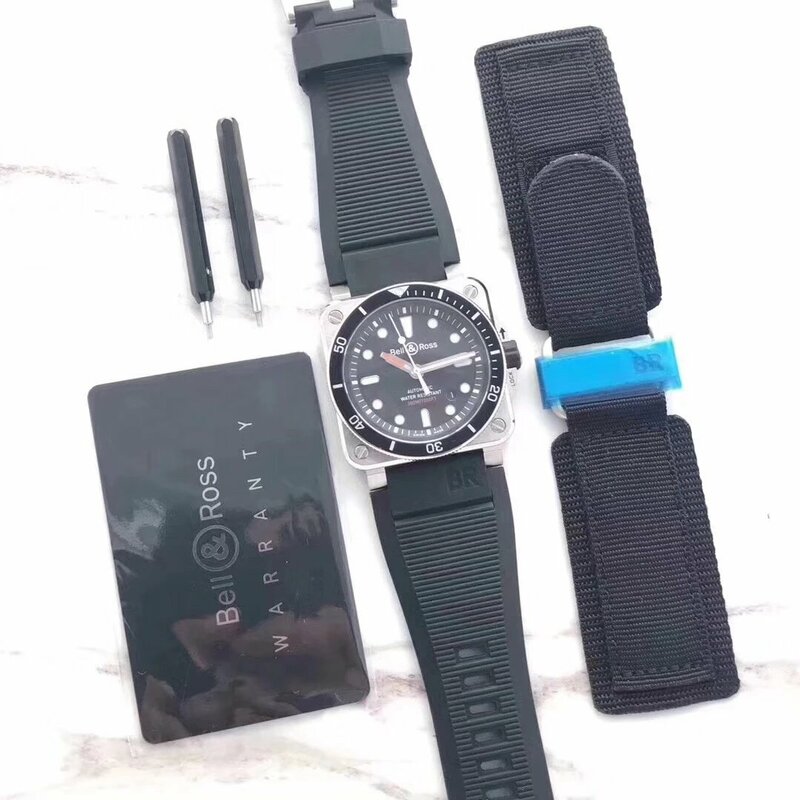 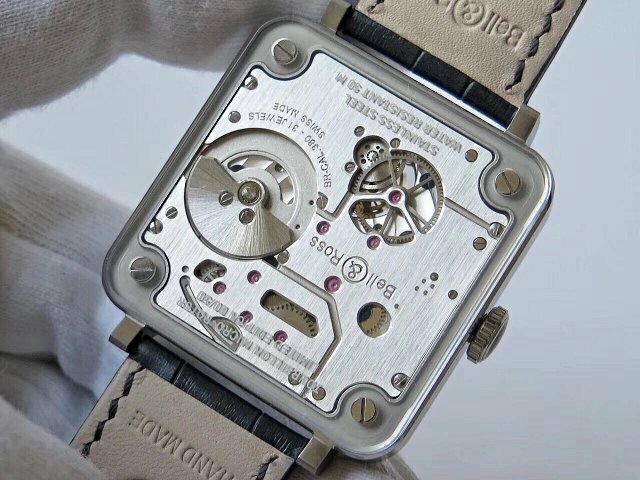 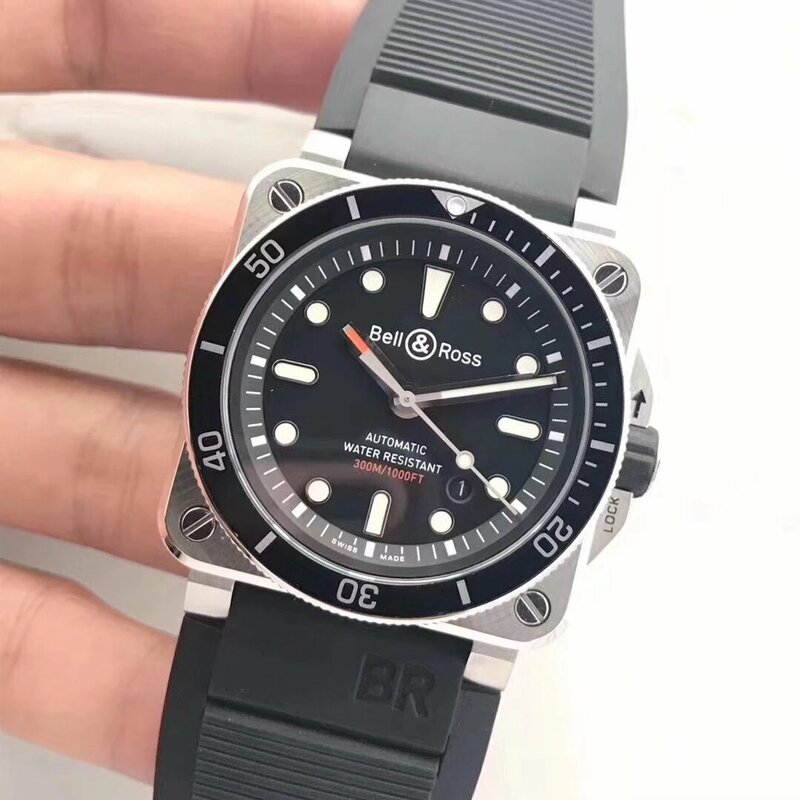 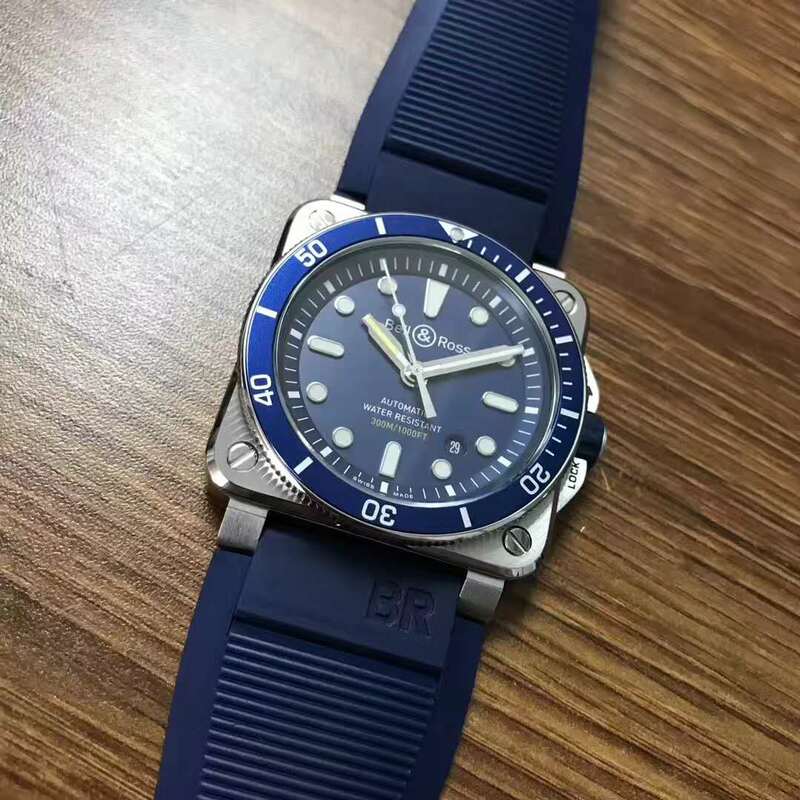 The Bell Ross watch belongs to BR03-92 series, the case is in classic square shape and in the size of 42mm*42mm, I always think that Bell Ross is more difficult to be held by the wearer than Panerai, it is not suitable for those people with thin wrist. 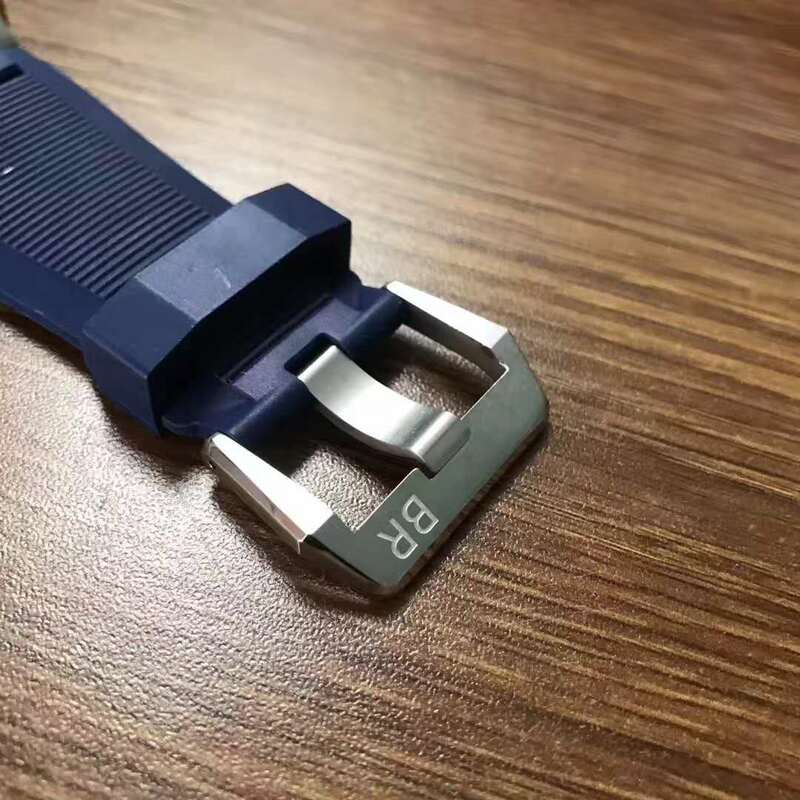 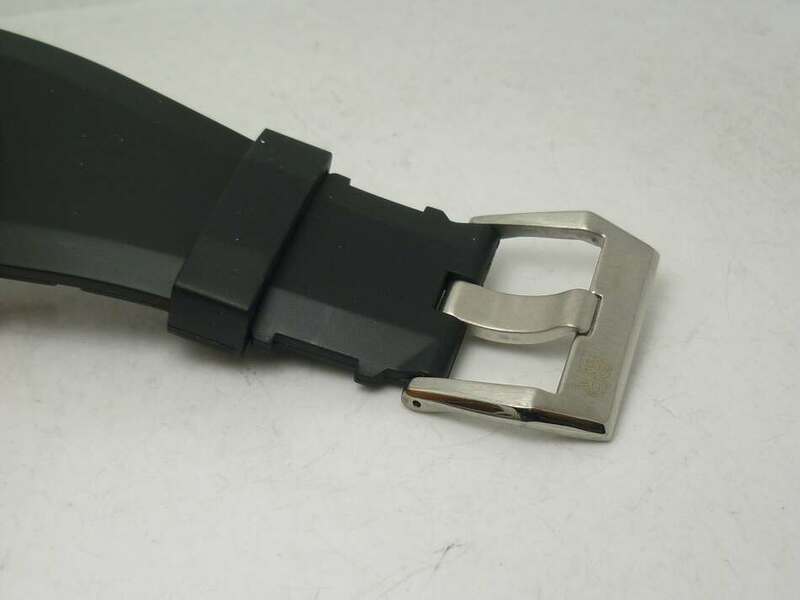 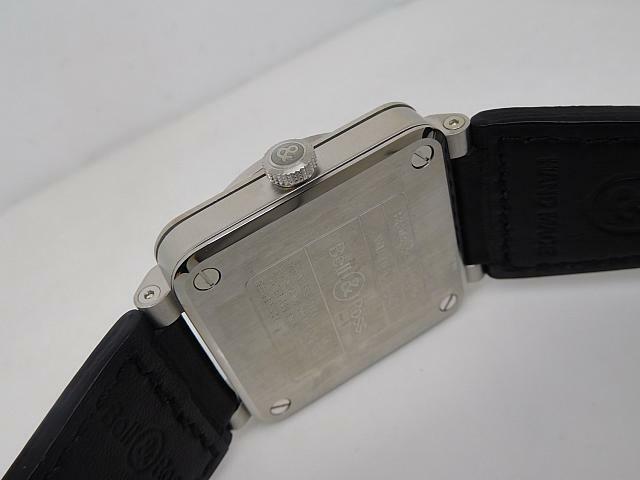 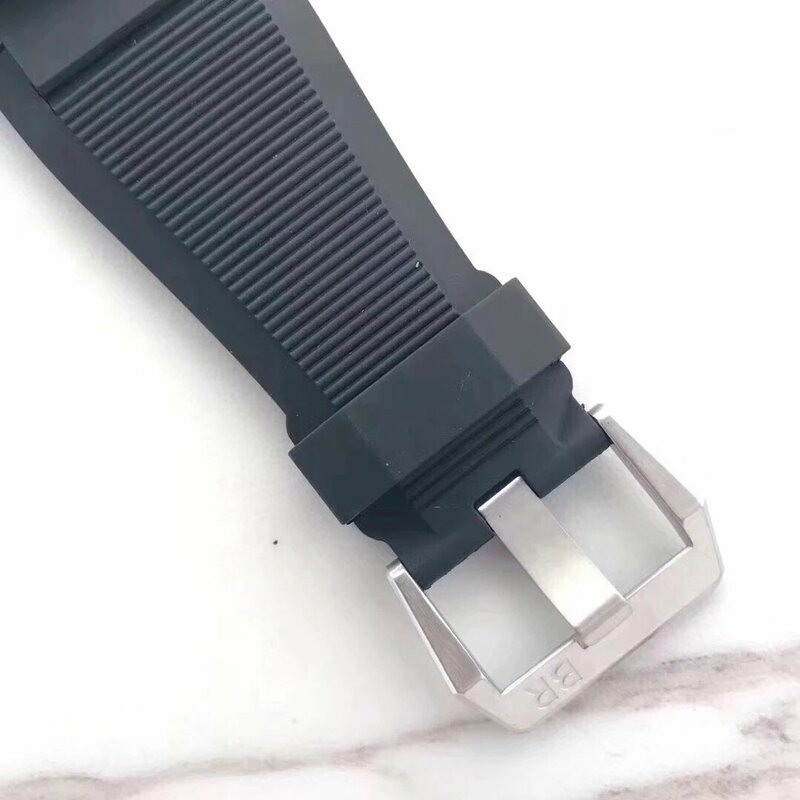 The case, bezel and lugs are all plated with black pvd coating, which evenly processed by machine, the front case is connected with the caseback through four big screws, this guarantees a better water resistance of the watch. 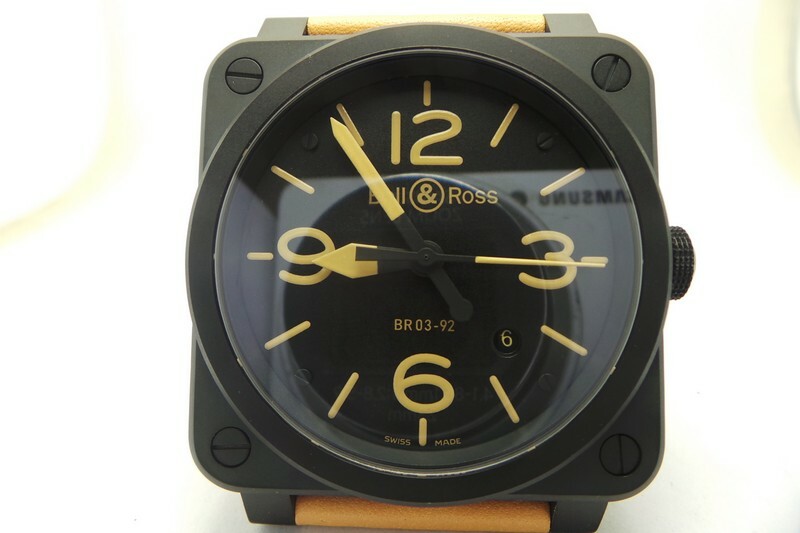 The dial is black with yellow printings and large 3-6-9-12 hour markers as well as hands. 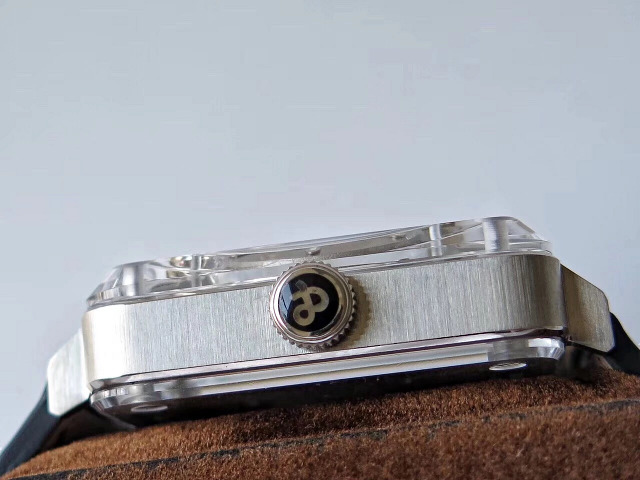 There are four screw studs on the dial that corresponding to the four big bezel screws, the dial is what I like most on the replica and it gives the wearer an easy-reading layout and design. 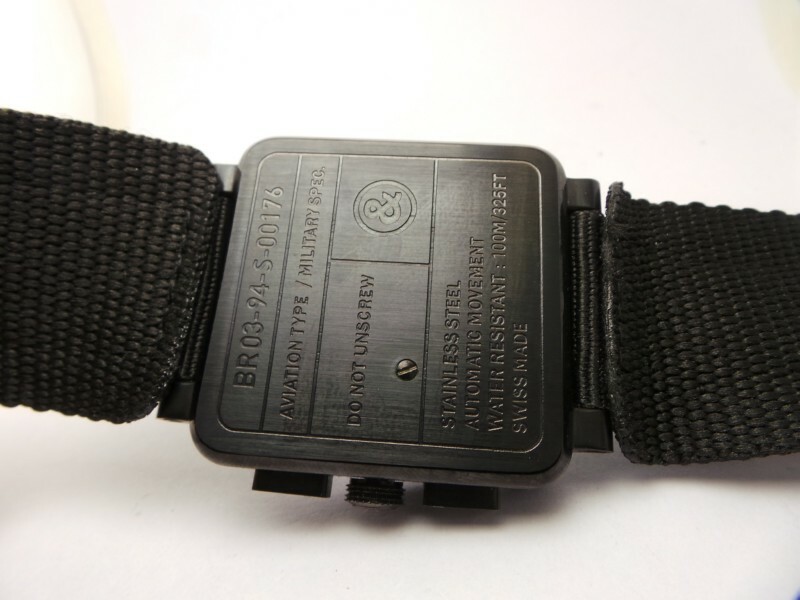 Besides, just holding the watch in the dark, you will find it will emit a strong green lume. 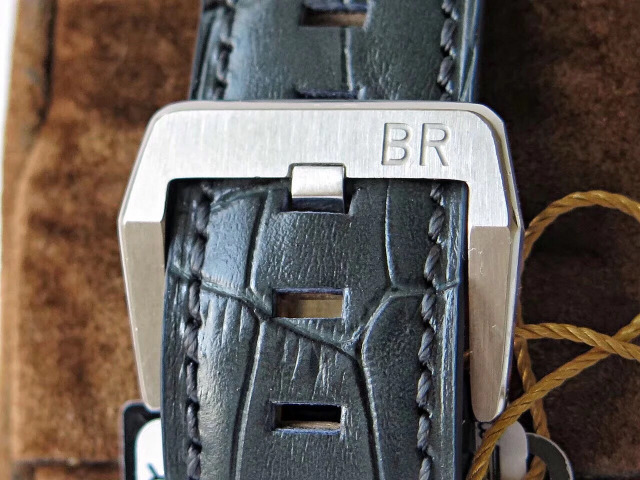 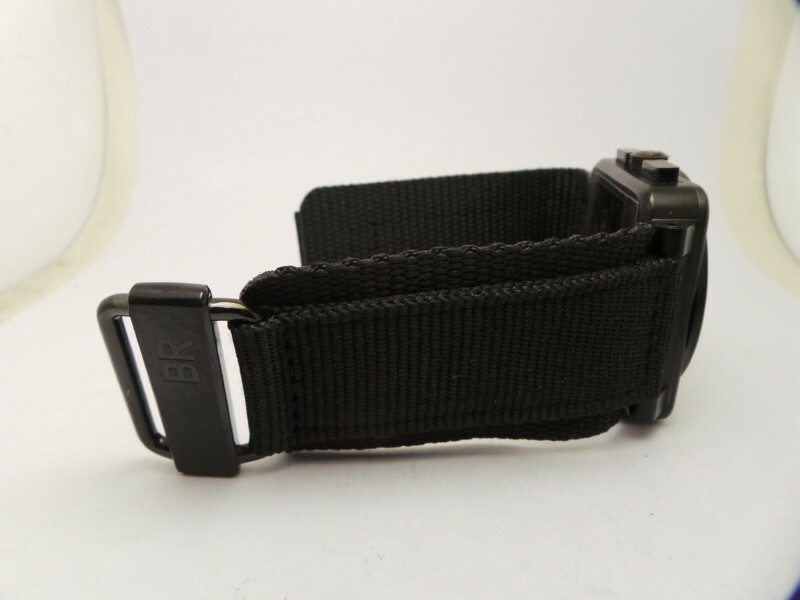 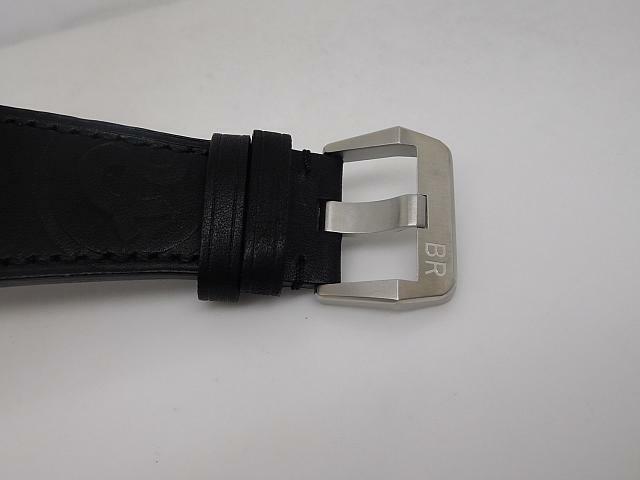 The brown leather strap is very beautiful, the color of the leather strap just exactly echoes with the hour markers and hands, white stitching is completely hand set, there is a big BR logo printed on the strap, looks very unique. 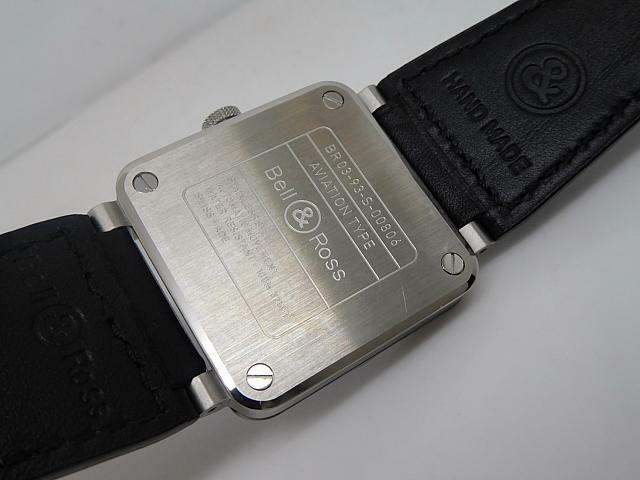 By the way, the leather strap is wide and soft, it gives the max wearing comfort. 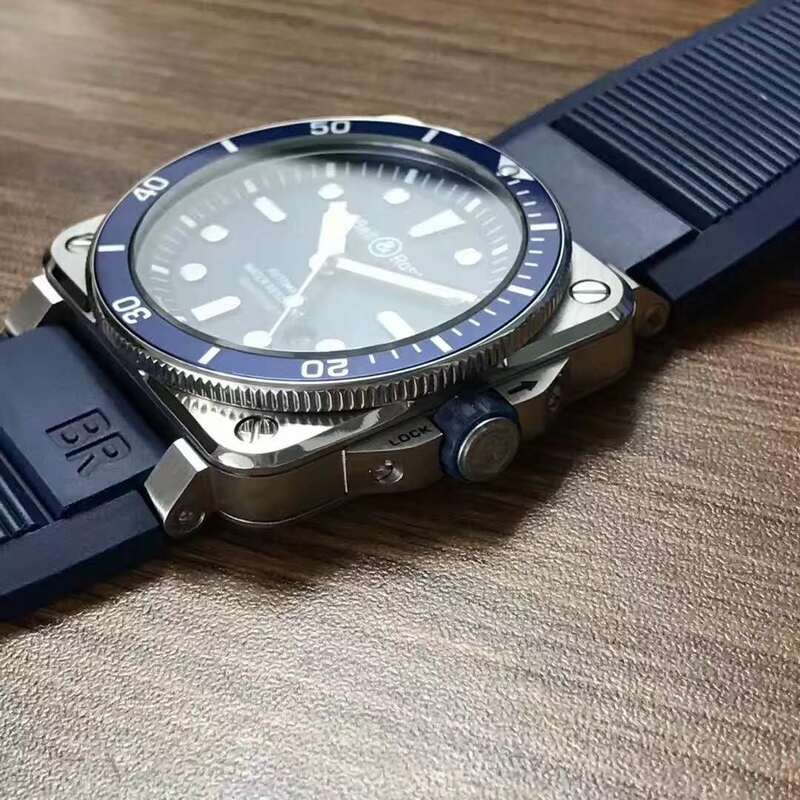 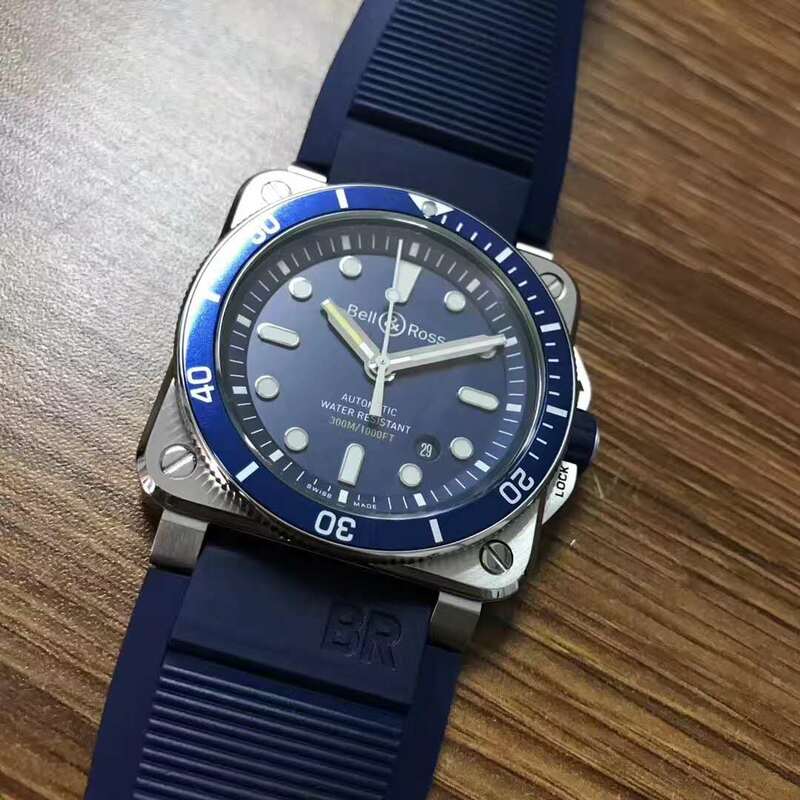 The replica BR03-92 is equipped with a genuine Japan Miyota 9015 movement, about its accuracy, I have tested it and the photo shown only 4 seconds faster each day, it is a standard accuracy for most quality replica watches but absolutely better than thos cheap knockoffs only sold at several tens of dollars. 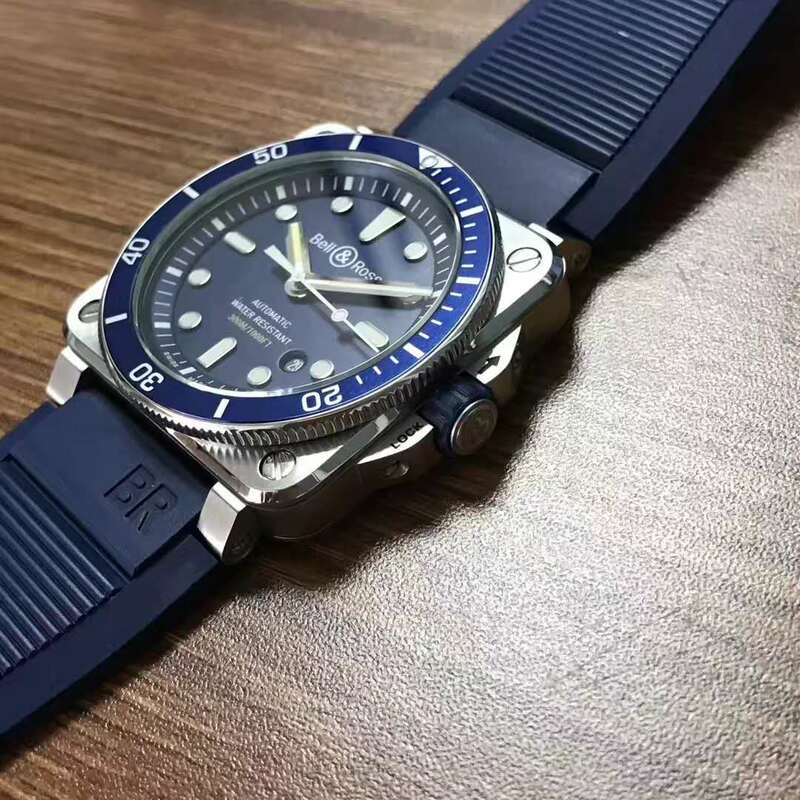 So, the price is not the most important factor to buy a replica, whether it could give you the exact genuine feeling just infect your decision. 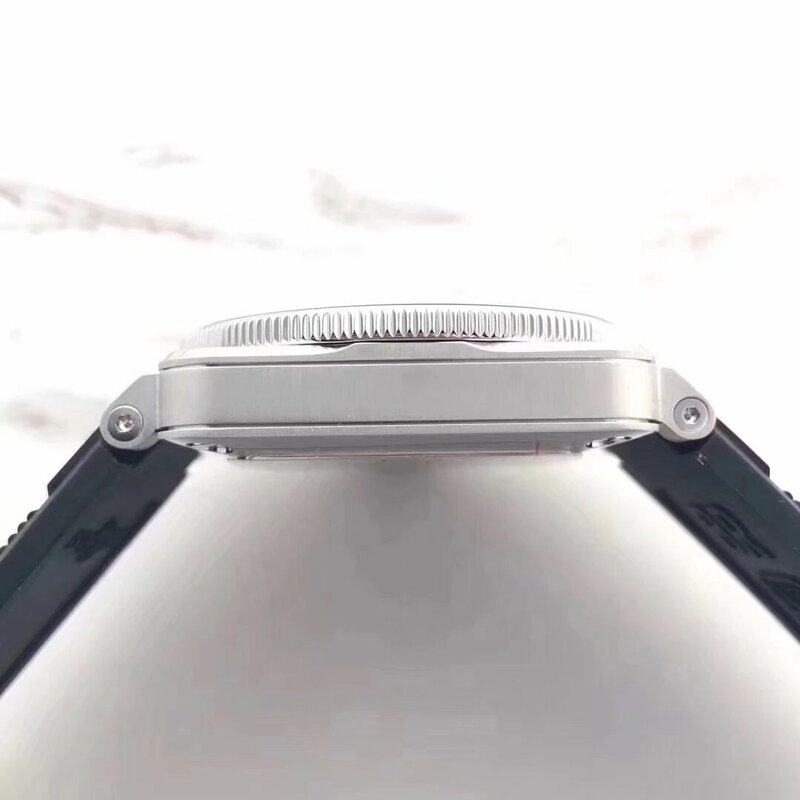 Some people may not understand the two buttons besides the crown. 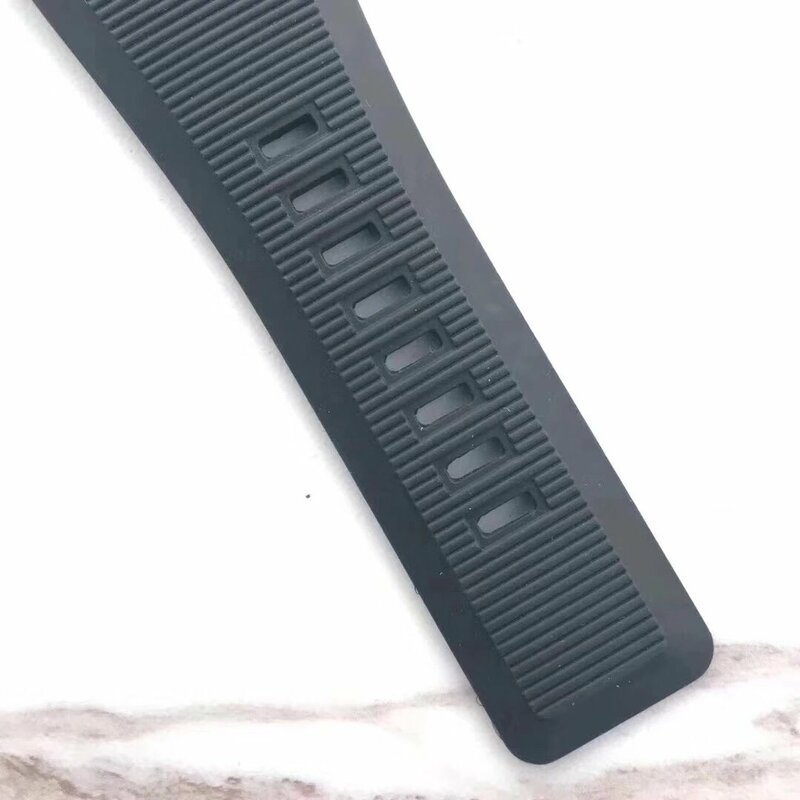 Let me tell you their usage. 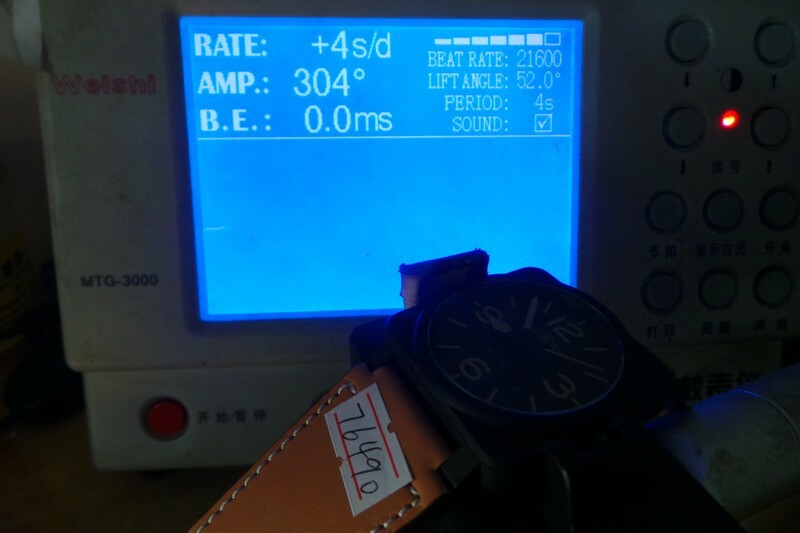 The 2:00 pusher is for start and stop chronograph function, while the pusher at 4 is for reset chronograph. 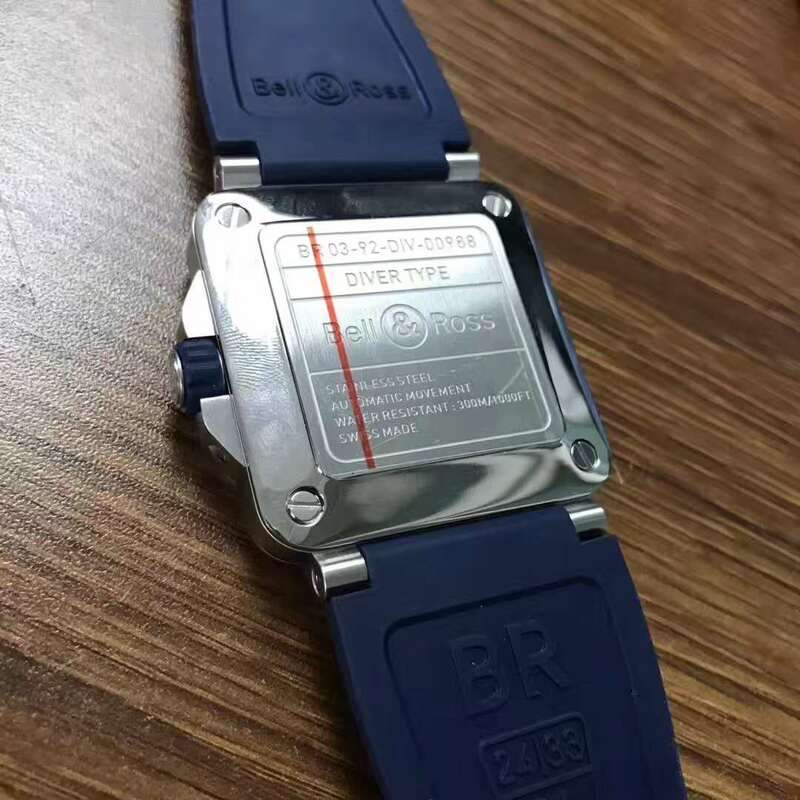 That means, when you press the 2:00 button, the central second hand on the dial will start to run, and it will stop when you press it again, if you want the hand back to 12 o’clock, you can press the 4:00 button. 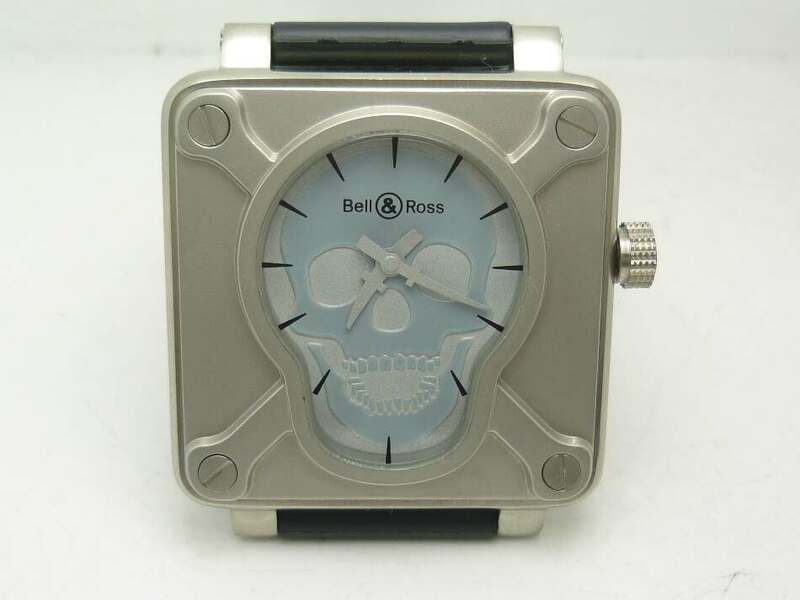 You will be surprised by this Bell and Ross watch when seeing its skull dial design, which is in light blue color. 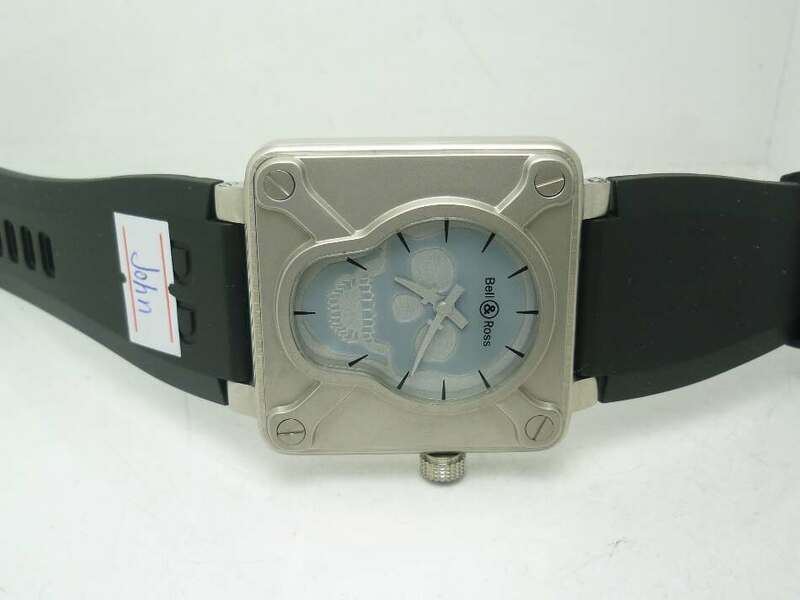 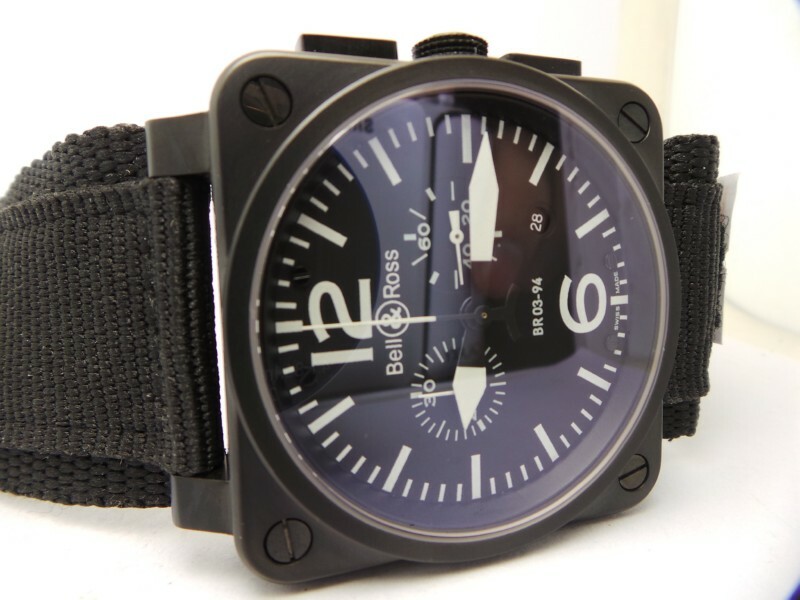 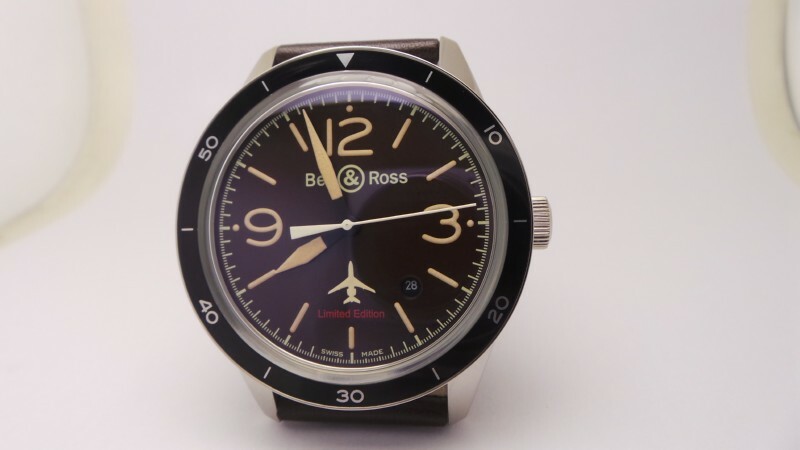 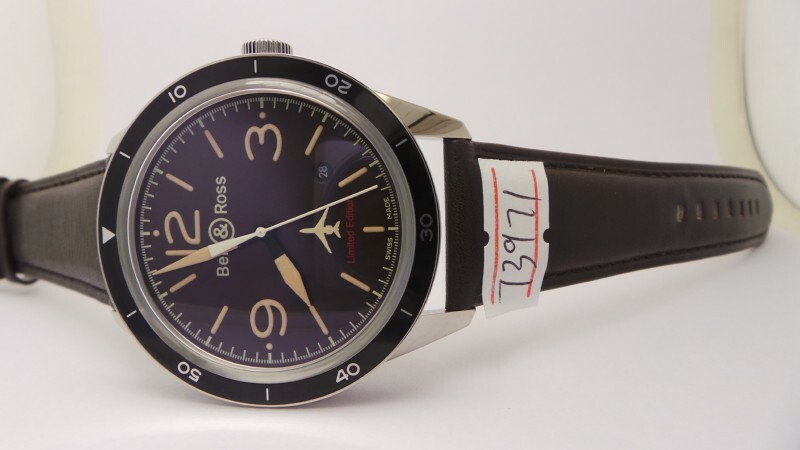 The Bell Ross BR-01 Airborne skull watch was released several years ago, it attracted the attention of many watch fans once being to the public. 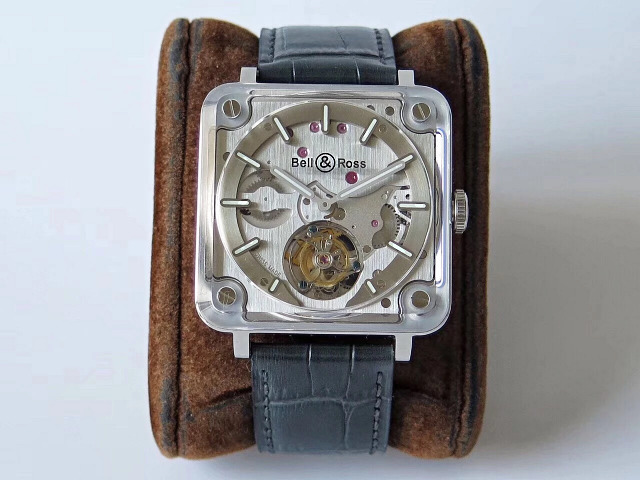 Today, the Bell & Ross skull watch I shared here is a replica version, it also has the cool charm like the genuine watch. 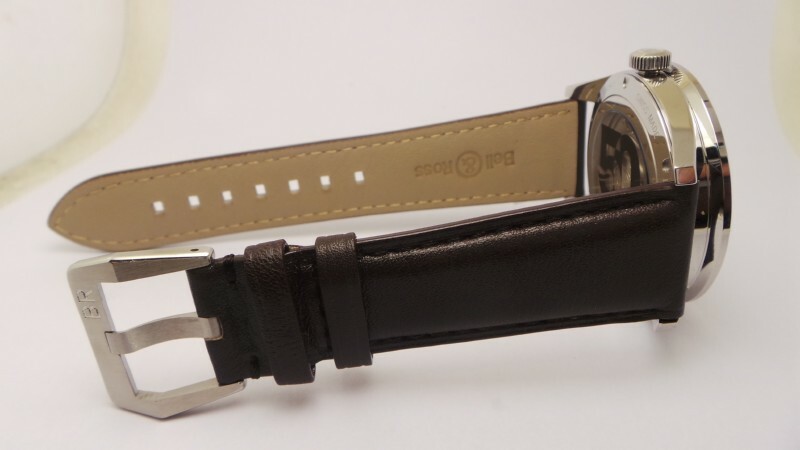 All parts of the replica watch look harmonious in appearance. 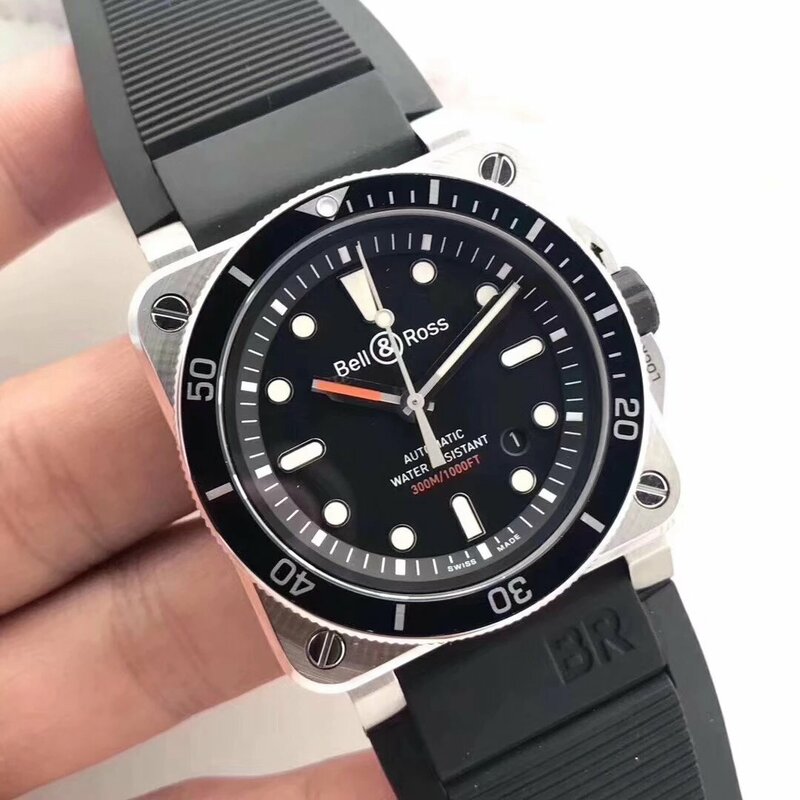 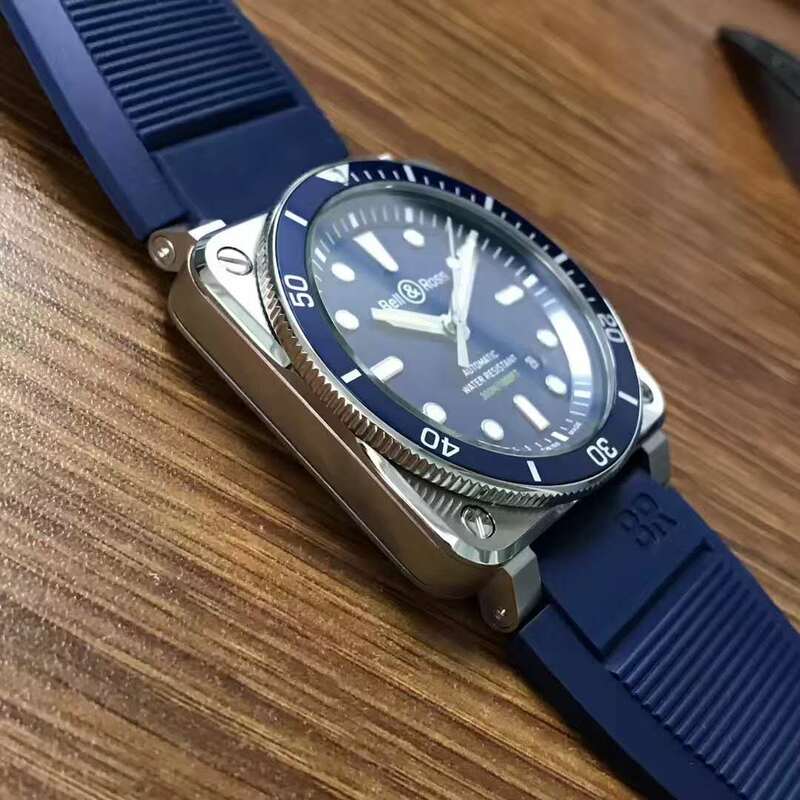 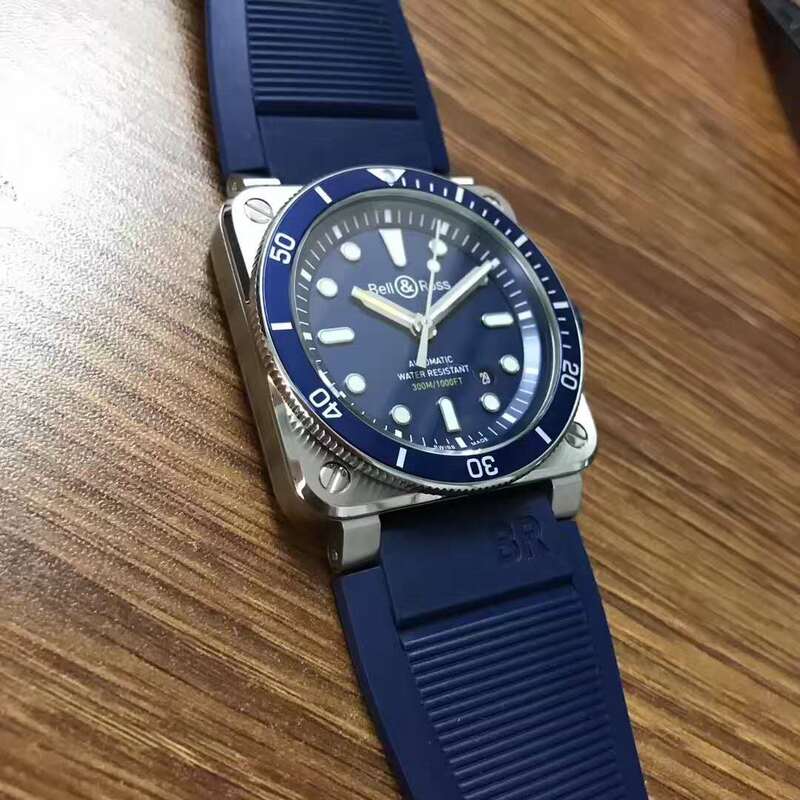 The watch should belong to the middle-class replica watch, which is better than these cheap automatic fake watches selling at one hundred dollars, but absolutely its quality can not be compared with the replica that are manufactured by big factories such as Noob, J12, BP, KW and so on. 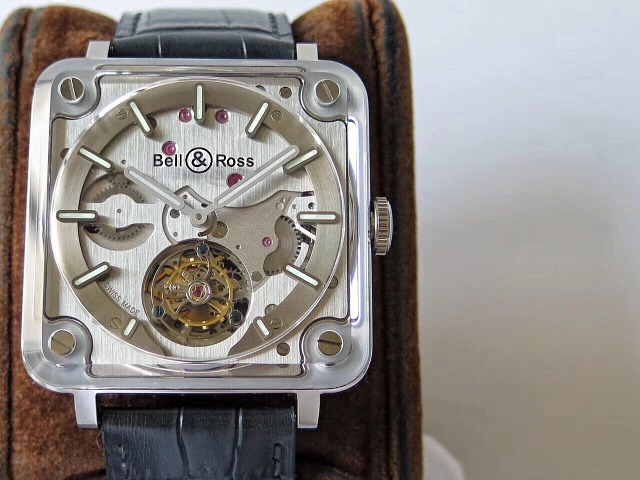 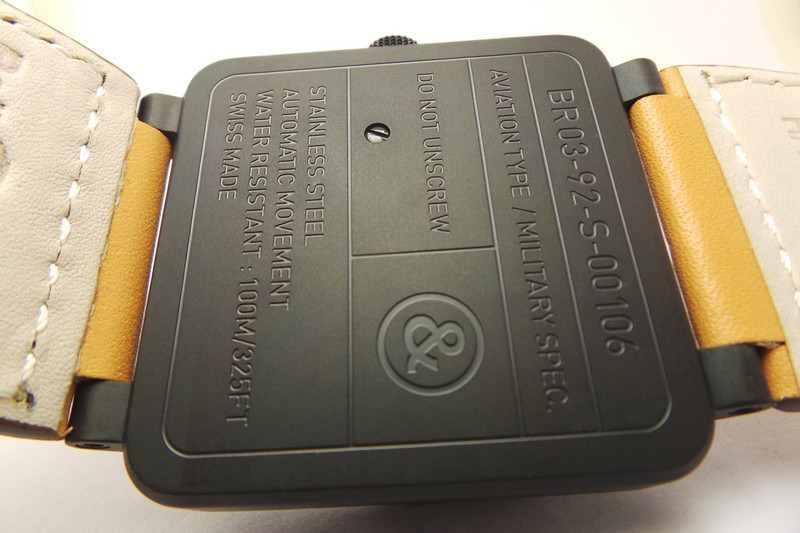 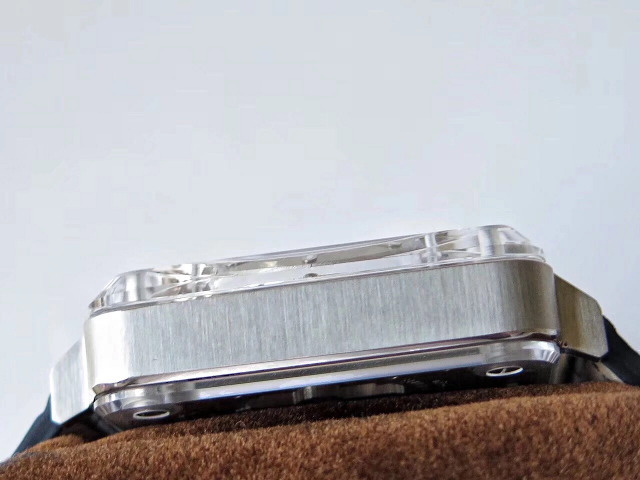 Classic square is the mostly used case shape on Bell & Ross watches. 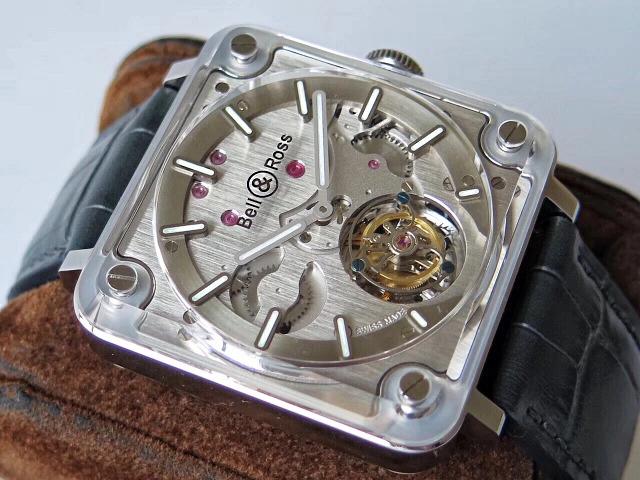 The replica uses 316L stainless steel case, there are four bone-like supports raising from the case that are fixed by screws. 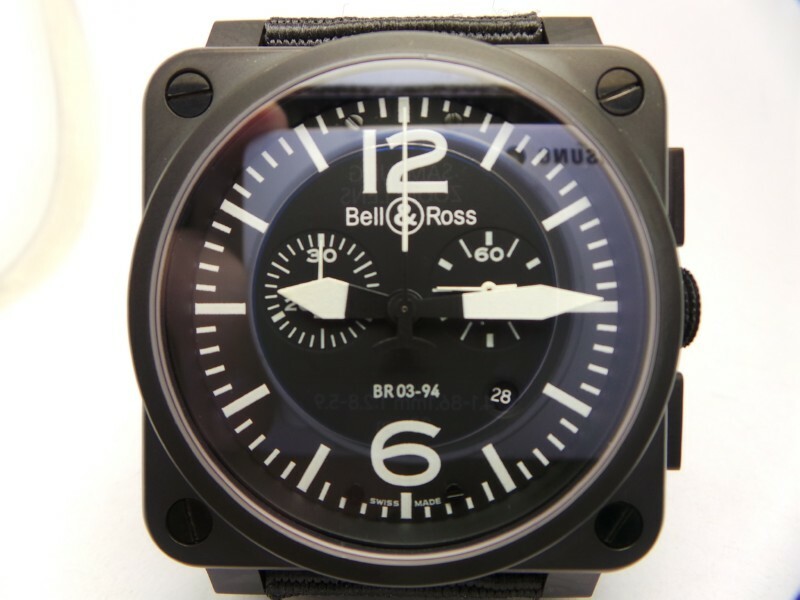 The dial is completely a skull pattern, Bell Ross logo is positioned at 12 o’clock, on the top head position of the skull, those hour markers are like the teeth of skull, while sword-shaped hour and minute hands look very cool. 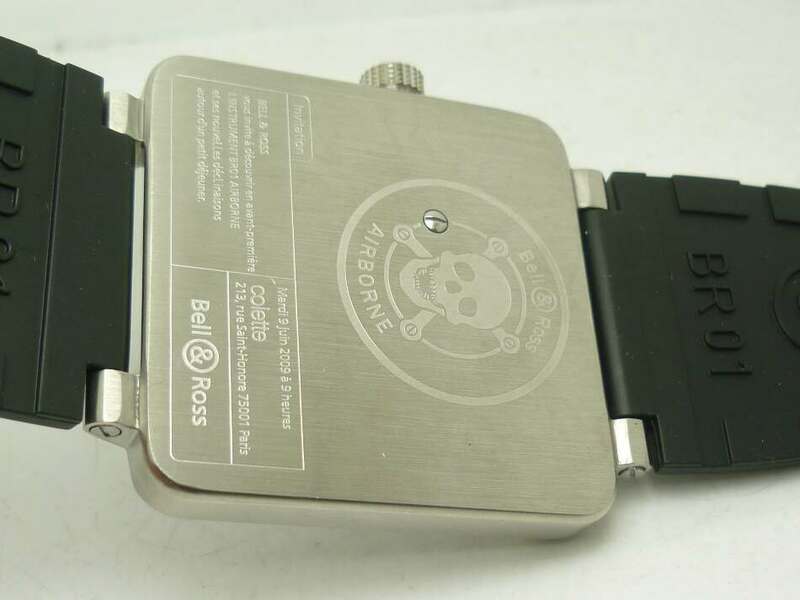 On the case back, there is also a more vivid skull pattern, there are also other engravings there, such as Bell & Ross, AIRBORNE and so on. 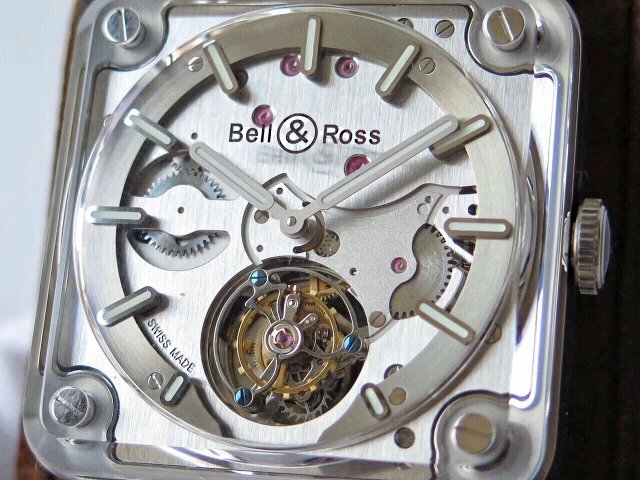 Inside the case, there is a more accurate movement, it is Japanese quartz, which has better accuracy than China automatic movement. 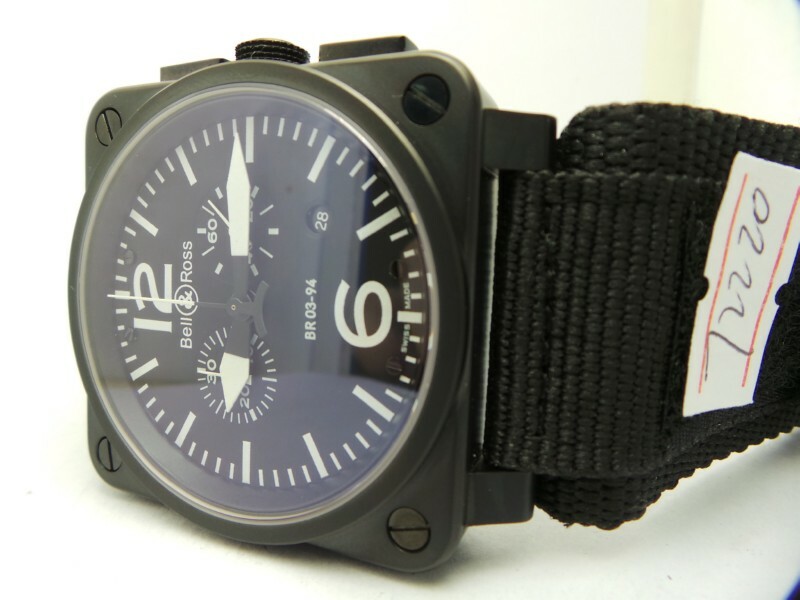 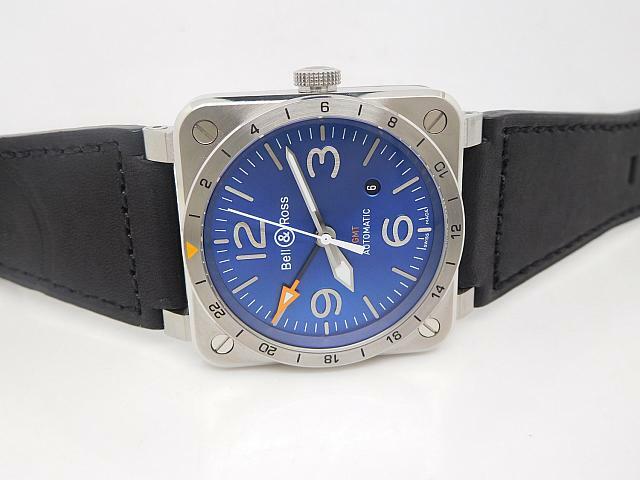 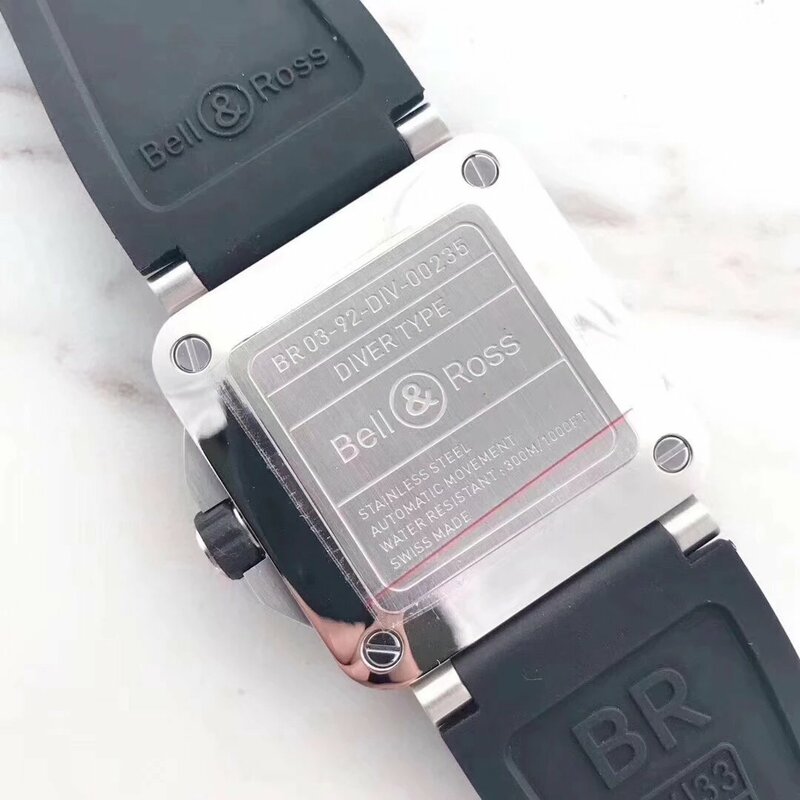 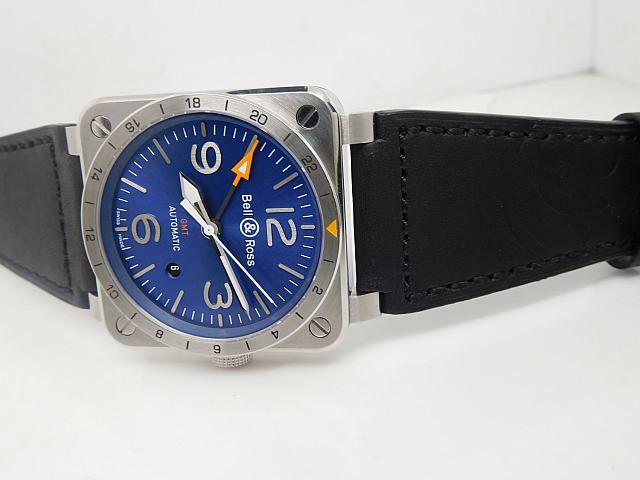 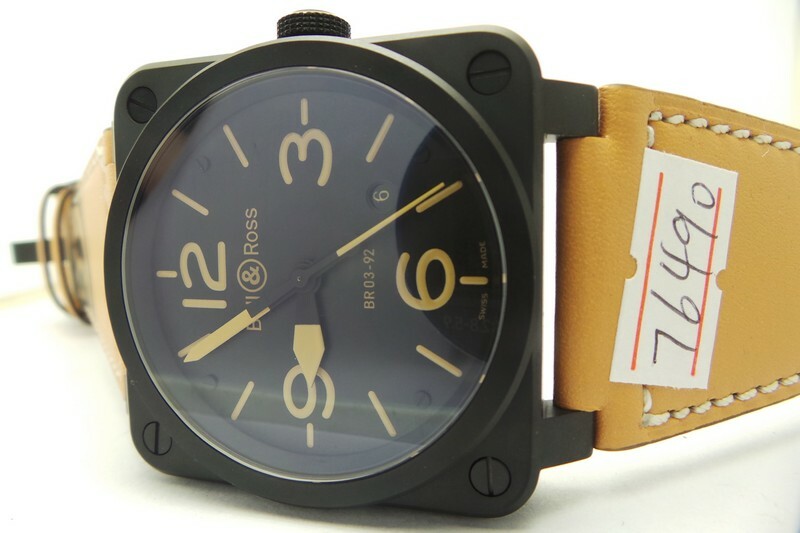 By the way, the replica watch features sapphire crystal and anti-dust black rubber strap, which also has Bell Ross logo. 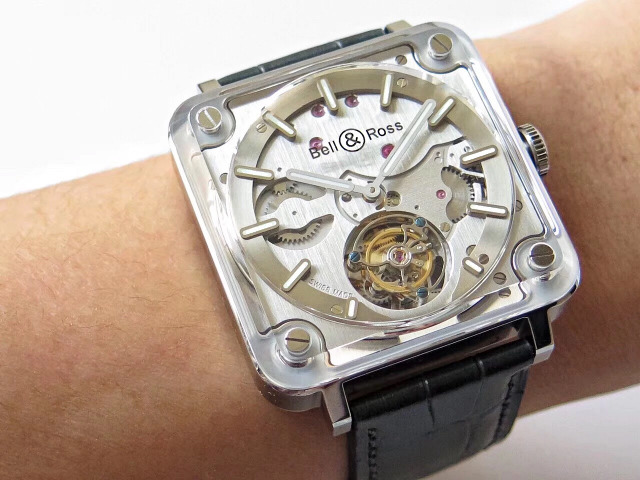 You can own such a perfect timepiece by only affording $178 US Dollars.